More than 10,000 women have fought in the Kurdish-Islamic State conflict in Syria. 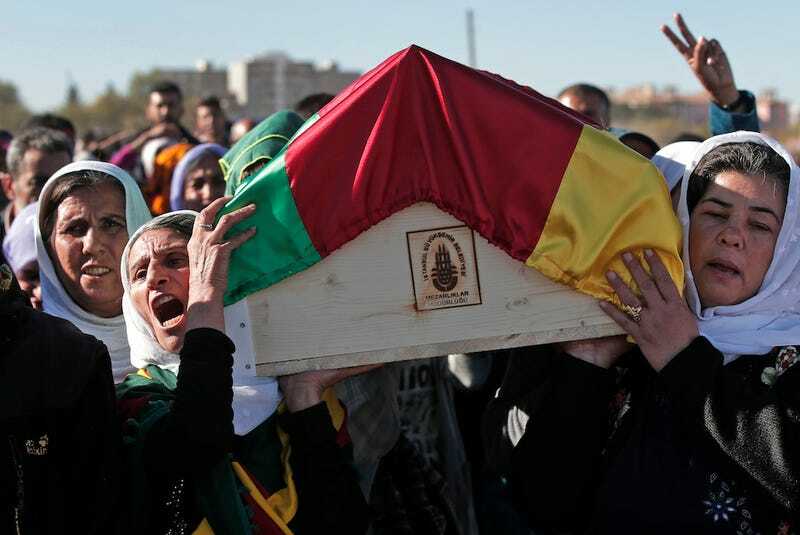 These mourners carry the body of 20-year-old Hanim Dabaan, killed in combat with Islamic State militants in the Turkey-Syria border town of Kobani, which has been under attack by ISIS for the last two months. In an NBC report on the unusually large female military presence in Kobani, 26-year-old Vivan Peyman states, "We stand and fight, especially here in the Middle East, where women are treated as inferiors. We stand here as symbols of strength for all the women of the region.... I promised myself that no matter where there is a minority that is under attack, I will be there to fight for their rights."